One of the most awaited bikes to come out this year, the Interceptor 650 is finally launched. The bike will be offered in three different variants – standard, custom and chrome with each being a bit more expensive than the latter. 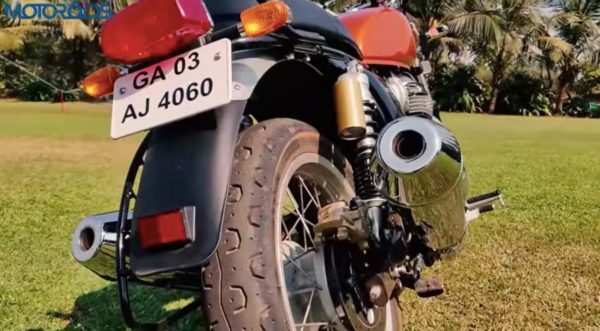 We were invited to ride the bike in the beautiful state of Goa where we grabbed an Interceptor by its scuff and thrashed it on the scenic roads over there. After a long and joyful ride on the bike, here is what we think about the new bike from Royal Enfield. 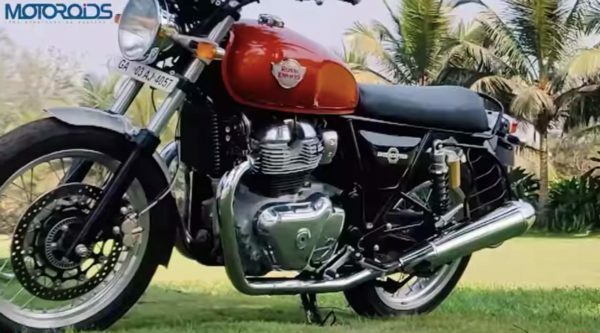 The design of this bike has been inspired by the Interceptors we have seen in the past, Royal Enfield used design cues from their history on the new bike which is quite evident on the current bike. The teardrop shaped fuel tank is quite a looker and is painted with top quality paint. The single piece saddle looks very nice and is comfortable to support you on long rides. 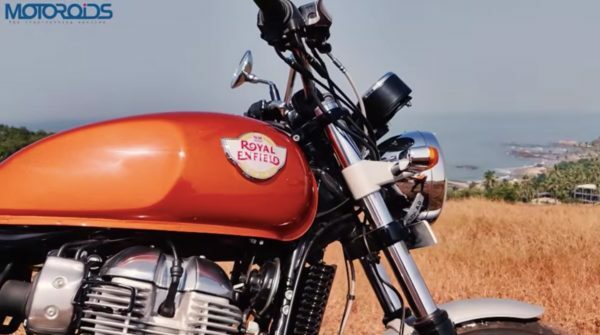 Royal Enfield has given great attention to detail which can be seen at many spots on the bike like the golden finished canisters for the rear shock. Up front, you get a circular headlamp which adds to the retro appeal of the bike. If we have to nitpick, we think the side indicators could have been made better and the insulation on the wires coming out of the brake lever could have been better. 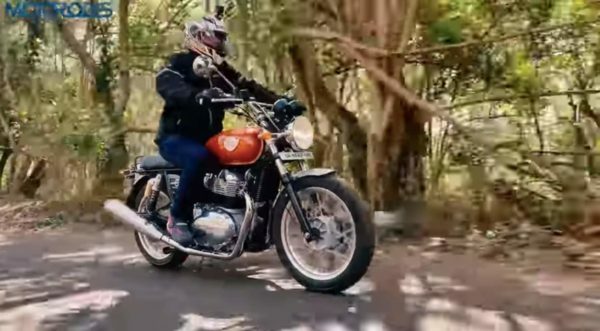 The riding position on the Interceptor is unlike any other Royal Enfield we have seen. It is a bit more committed, which we find to be a good thing as this is a bike you would love to enjoy on the corners. The riding position, however, is not as committed as seen in the Continental GT 650. The switchgear is placed perfectly and again made of supreme quality. The rider’s knee stays very close to the engine but Royal Enfield has given it a thought and placed a small guard to protect it against any accidental touches. The seat height is not too high which makes it very easy to hop on and off the bike, for both rider and pillion. The footpegs for the brakes and the gear lever are placed a bit ahead compared to the Continental GT 650. The bike is powered by an all-new 648 cc air-cooled, SOHC, fuel-injected, parallel-twin motor producing out 47 hp at 7,100 rpm and 52 Nm of torque at 4,000 rpm. Paired with a 6-speed transmission the bike also gets a slipper and assist clutch. The power is very good and the bike is a joy to ride. 0 to 100 comes in less 7 seconds which very quick. We could not find a long stretch of road to see the top speed of the bike but we do believe it could go till the 180 kmph mark. Braking is done by disc brakes at both ends and yes, dual channel ABS is on offer but cannot be switched off. The brakes are good but we would have liked a more forceful bite on them when we were riding the bike hard. Expect the bike to return 20 to 25 kilometres for a litre of fuel. Prices of the Interceptor 650 start at INR 2.5 Lakh for the standard variant. The custom and chrome variants are priced at INR 2.57 Lakh and INR 2.7 Lakh respectively. (All prices are Ex-Showroom) At this price point, the bike offers great value for money and there is no product that can be compared to this bike. If you are looking for a bike which is a relaxed cruiser but can offer you thrill on the corners. Royal Enfield has great faith in this product that’s why you get a 3-year warranty along with 3-year roadside assist plan. A test ride of this bike will definitely change your perception of the brand. Do watch our in-depth review of the bike below.